For many, the transition back to school after a long-term can be difficult– it isn’t just homework that returning students have to catch up on; they must balance their extra-curriculars, social life, and academics– all while recovering from an illness. However, DGN does provide some aides to make the transition seem less daunting. Hospitals provide highschool patients with tutoring. In order to help homebound students to keep up with class, a homebound liaison is assigned to them. Whether or not a student is assigned a liaison depends on the cause of their absence and when they will return. Homebound liaisons such as Michelle Geraghty are not like tutors, instead, they focus on teaching students organizational skills to help them from falling behind on schoolwork during and after their absence. One of the challenges teachers and liaisons alike are faced with is determining how much work to assign homebound students. “It’s a juggling act; you want the student to move forward but at the same time, you want that student to get a good education because later down the road, this is going to impact them and if they don’t have that background knowledge it will affect them,” Geraghty said. Erin Ludwick, the new assistant principal for student support services, has found that teachers are more flexible with classwork when a student discloses the reason for their absence. Typically, this information is confidential, but if a student wishes, the cause of their absence can be shared with teachers. If they choose not to, teachers will simply be told that the student will be absent. DGN does not specifically provide aid to help students transition back socially. However, DGN’s hospital transition coordinator & social worker, Kristy Scholtes, whose role is to support students who are hospitalized or out of school for extended periods of time due to mental health concerns, says she would be interested in helping students feel more connected. During her sophomore and junior year, Fumei Jackson was in and out of class due to mental illness, which, according to Dean Kelly Zuerner, has been a growing cause of student hospitalization at DGN. Whenever Jackson returned to school after a long-term absence, she would hope that things would return back to normal. Although teachers were understanding of her situation and did not ask too much of her, transitioning back socially was difficult. “It wasn’t like it was before– I just missed out on everything. Teachers will talk about funny things that had been talked about in class– they made references to things. It made me feel like I was out of the loop. It made me feel like a stranger– like a new student in a brand new class,” Jackson said. 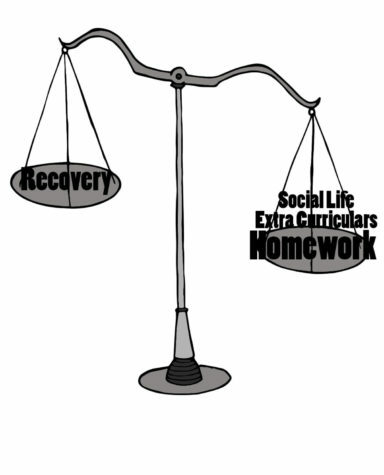 Eventually, catching up on schoolwork became a distraction from recovery. Jackson made the decision to “withdraw;” Jackson un-enrolled from her classes and DGN altogether. From early April until this August, Jackson took classes online. “It was hard because half of me wanted to catch up on school and everything but the other half of me wanted to make sure that I was feeling well and getting better. It wasn’t an inconvenience but I was really internally torn– ‘where do I want to focus?’ That ultimately led to why I withdrew; catching up academically was just really hard and I just really needed to focus on healing and recovering. I knew I’d be able to get back into school when everything is better,” Jackson said. Since then, Jackson has re-enrolled and is scheduled to graduate in 2019. When a student returns to school after a long-term absence, there is a transition meeting. This transition meeting is required if a student was hospitalized. During this meeting, the student’s support team, and parents, and the student themself if they are able, meet to discuss the student’s transition back to school. During the meeting, attendees discuss the student’s schedule and make sure that they have plenty of support. In some cases, a student’s schedule can be rearranged or the student can return part-time. While teachers and administrators alike may encourage their students to focus on their recovery, the truth is, many students, like sophomore Lynn Pollack who was absent due to chronic migraines with aura, feel an internal pressure to prioritize their schoolwork. “During my absence, I felt like I was just trying to get better and waiting to stop being in physical pain. After my absence, I was not even trying to recover anymore, my classwork was more important than my health. That’s just how life is, school and work will always be more important than my health,” Pollack said.